in the direction of the first shot that missed John F. Kennedy. In 2011, in a project underwritten by The National Geographic Channel, investigative journalist Max Holland (Editor of Washington Decoded among many other credits) along with some retired FBI and Secret Service personnel were able to view digitally enhanced copies of 8mm home movies that were taken during the Kennedy Assassination back in 1963. By getting a more accurate look at the events that transpired, particularly the reactions of people and the placement of vehicles on the roadway, this team was able to piece the various strings of film footage together to recreate an accurate time line of the events that took place on Elm Street in Dallas, TX. What about the bullet that struck a concrete curb across from the infamous grassy knoll from which a fragment struck and wounded James Tague who was standing in the median near the Stemmons Freeway overpass? Could there have been a second gunman on the grassy knoll? That question spawned all sorts of theories over the decades following the assassination. A detailed Analysis of the enhanced photos revealed that only three shots were fired and that the first shot missed Kennedy. Initially it still wasn't clear how a shot reached the concrete across the street from the grassy knoll causing a spurt of concrete dust and a bullet fragment to strike Tague. However close inspection of film footage of the FBI reenactment of the incident revealed a plausible explanation. Oswald's first shot struck a traffic signal outside his window. This possibility literally came to light when the FBI footage was digitally enhanced. The FBI borrowed a white limousine for this reenactment. 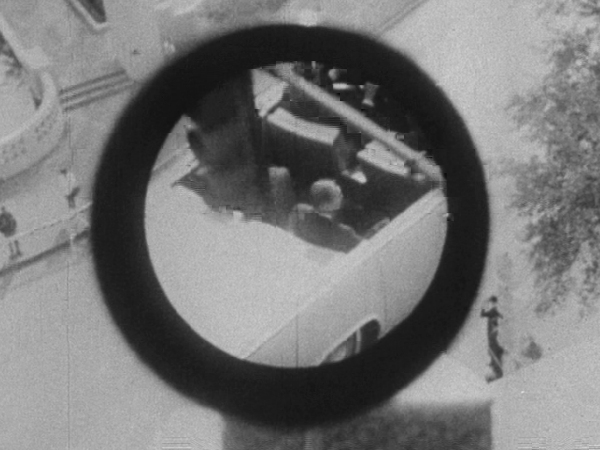 The view in this still frame is taken through Oswald's scope. The hole appears in the back plate of the signal once the white vehicle is behind it. 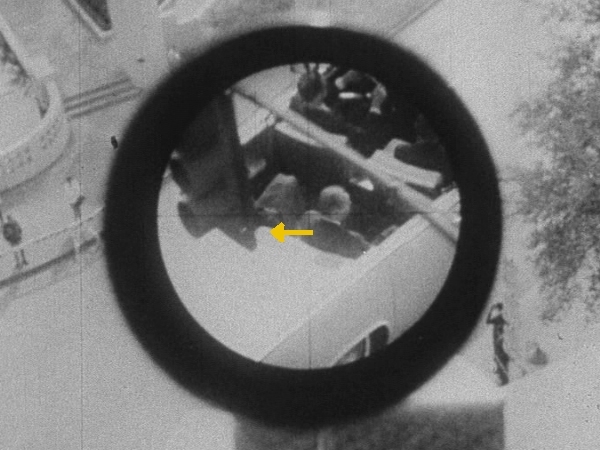 At the time of the first shot, Kennedy's head would be passing below the traffic signal. 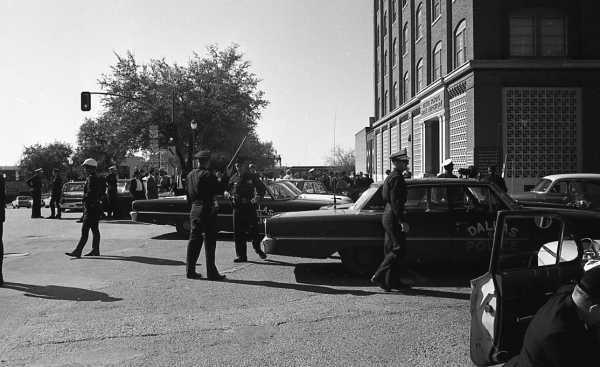 Oswald was likely following Kennedy in his scope, firing the first shot just as Kennedy passed under the signal. The shot appears to have struck the signal in the lower right corner area where the signal body meets the back plate. 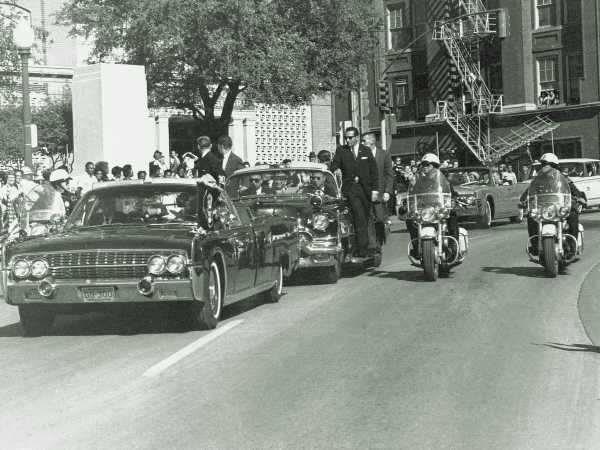 Oswald then had to reposition himself in the window to take two more shots once the President's car cleared the signal and the adjacent tree. 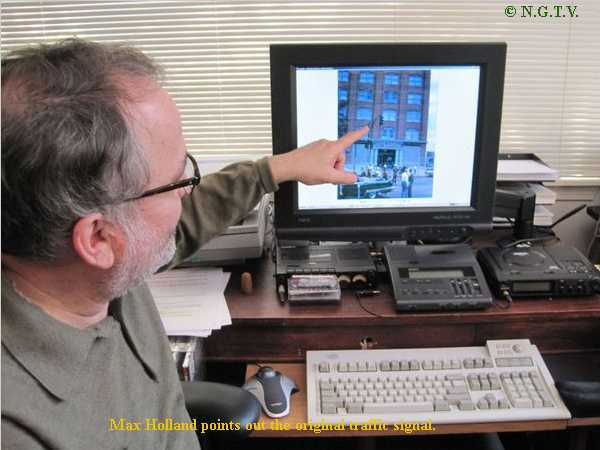 Max Holland shows the relationship of the signal to the line of fire.